The increasingly popular Americas Cardroom has announced that – for one week only – it will be doubling the guarantee in its feature tournament up to $100,000. The leading skin on the US-friendly Winning Poker network has recently had no trouble reaching the $50,000 guarantee on its weekly $215.00 buy-in tournament but, on Sunday June 9th, the site could be providing a massive opportunity for a significant overlay by doubling up the guaranteed prize money. Last weekend, for example, 207 players entered (and re-entered) the tournament – creating a prize pool of $56,400 which was shared between the top 45 players, and it is a big ask to get twice as many players involved in the tournament with the competition from other US poker sites (or even from the Rest of the World). Consequently, Americas Cardroom has released details of a comprehensive satellite schedule which should encourage players with smaller bankrolls (or those who have never played on the site before) to take a chance at playing for the $20,000+ first prize. Every hour (@ 35 minutes past the hour) there is a $0.90 + $0.10 turbo re-buy satellite guaranteeing one seat into the nightly $20.00 + $2.00 freezeout which guarantees a minimum of two seats into Americas Cardroom $100,000 Sunday´s tournament. Also on Sunday, prior to the feature tournament which starts at 7.00pm Eastern Daylight Time, there will be a host of $20.00 + $2.00 buy-in tournaments guaranteeing between one and eight seats to the target tournament. Some of these (if not all) will offer exceptional value to players looking to qualify their way into the Americas Cardroom $100,000 guaranteed tournament. An hour before the cards are in the air for the $100,000 guaranteed poker tournament, Americas Card Room is also hosting a $50.00 + $5.00 buy-in qualifier for the Punta Cana Classic in November with ten $4,100 packages guaranteed. The Punta Cana Classic is a live event played at the Hard Rock Casino in the Dominican Republic which has its own $500,000 guarantee and the packages up for grabs on Sunday night include the buy-in for the event, air fare (up to $800.00), transfers to and from the airport, six nights all-inclusive accommodation at the Hard Rock Hotel and $1,500 credit at the resort to spend on golf, spa treatments and excursions. 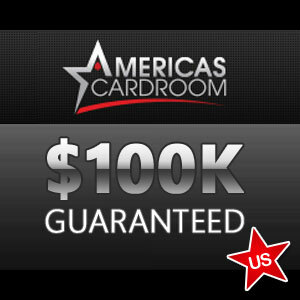 In addition to all the above potentially lucrative opportunities, Americas Cardroom is offering new players who download the software from one of our links a 100% first deposit match bonus on deposits up to $1,000. As Americas Cardroom is one of the few remaining online poker rooms which allocates bonuses on the ‘dealt rake’ distribution method, the poker bonus is one of the easiest to clear of any poker site accepting players from the USA.